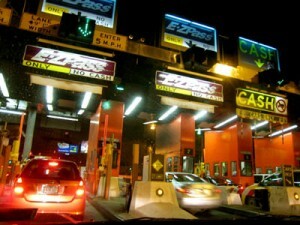 Due to the nature of the penalties associated with EZ Pass Violations, our firm DOES NOT handle these tickets. While we can’t assist you with this matter, we have provided the below for informational purposes. Since the inception of E-ZPass, many of us have been able to zoom on through toll booths without having to wait in long, unpleasant lines. When we are going through the tollbooth with our E-ZPass, most of us care little about the speed limit and cruise right on through as if it was never there, especially if we are in the Express E-ZPass Lane. However, doing this actually can lead to your E-ZPass being taken away from you and the issuance of a NY speeding ticket. What is an E-ZPass Ticket? Remember all that paperwork you had to fill out in order to first get your E-ZPass? Somewhere in there was a License Agreement along with some Terms and Conditions that you agreed to by signing and mailing it back. One of those conditions was that you would approach and pass through the E-ZPass Lane at or below the posted speed limit. If you fail to do this, E-ZPass has the ability to actually take away your E-ZPass privileges. Usually, if you speed enough times through the E-ZPass Only Lane, you will receive a warning letter in the mail letting you know that speeding through the E-ZPass Laneis a breach of their license agreement. Although many people receive these letters and continue to speed on through without having any consequences, plenty of people are not as fortunate. If E-ZPass catches you zooming through the E-ZPass Only Lane after they already mailed you a warning, they can completed suspend your privileges for 60 days. If you still do not learn your lesson and get caught three times, they have the right to completely revoke your E-ZPass privileges entirely. Remember, the offenses are account-specific, not device specific. For example, if your family has three cars (one for you, one for your spouse, and one for your oldest child) and each one has an E-ZPass, all three are hooked up to the same account. This means if you, your spouse, and your child are all caught once, this amounts to three separate offenses. Luckily, since an E-ZPass ticket is not technically a “ticket” as we come to think of them, you will not have any points added onto your driver’s license or incur an insurance hike. This is because you are violating a term of the license agreement and E-ZPass lacks any legal authority to act as a police officer or to issue real tickets. However, if you are caught by an actual police officer while speeding through theE-ZPass Lane, that officer is well within his legal right to pull you over and issue you a ticket.